Are you thinking about serving a roast, ham or Turkey for your Christmas meal? Yes? Have you covered off a sharp and capable knife? Carving knives, slicing knives or Suhijiki’s in Japanese terminology make the perfect knife to carve up this meal. Show off and carve in front of your guests. I am sure they will be impressed! Let me give you some examples of good uses for carving knives. In the first place they are used for roasts, hams and roasted poultry. Not only cooked proteins are sliced with this knife it is equally good to carve dry cured ham or smoked salmon. Some chefs use the knife to carve up fruit for impeccable fruit platters. The blade is long and slender, ideally between 240 mm and 330 mm so it is easy to slice in one fluid motion. Start from the heel of the blade and slice towards you in one motion. Avoid a sawing motion because this will give a jagged appearance. A good carving knife should be thin behind the edge for efficiency slicing. This is really important to carve, a thick edge would only wedge and give an unwanted presentation. It makes sense that a carving knife should be razor sharp to do a perfect job and exclusively used for carving. If you want the edge to last longer you should hone it often and protect the blade with a saya or store it in his original box. At Artisan Knives we stock the Masakage Yuki and Koishi 270 mm slicers. These knives are hand made by an Artisan knife maker in Japan. Not only do they perform great but also are beautiful to look at and will definitely impress your guests when carving in front of them! 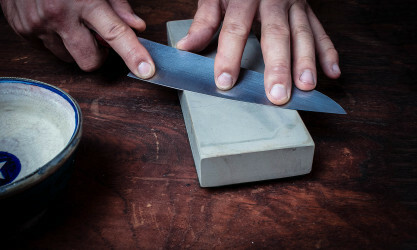 If you are getting organised for the Festive Season, think about getting your knives sharpened. A sharp set of knives will contribute to the success of you meal and make preparations so much easier.